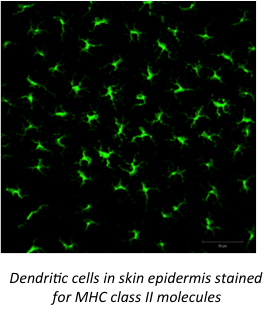 Dendritic cells (DC) collaborate with T cells to initiate immune responses and do so by capturing antigen, processing it within compartments of the endo/lysosome system and creating peptide/MHC complexes that are returned to the cell surface for scrutiny by T cells. Superimposed on this a re the events of DC migration which requires crossing of cell and matrix barriers to bring DC together with T cells in lymphoid organs. Our lab is interested in the cell biology of DC at the early stages of this response, in the events of antigen processing and presentation and more generally in endo/lysosomal proteases and their regulation in immune cells. We are studying the acute responses that DC make to microbial products, particularly how they are signaled by MAP kinase pathways and how they affect the cytoskeleton. We are testing new approaches to manipulate how antigens and vaccines are processed in antigen presenting cells. Evidence from our lab and others suggests, somewhat counter intuitively, that reducing their susceptibility to processing might improve the performance of some vaccines. 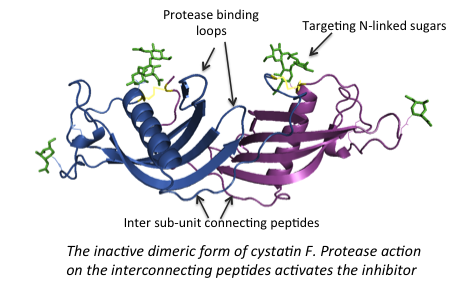 Proteases are often regulated by protease inhibitors and we are studying an unusual protease inhibitor called cystatin F or leukocystatin that is almost exclusively expressed in immune cells. Cystatin F is made in an inactive dimer form and activated by proteolysis. This very distinct mode of activation suggests that cystatin F may protect cells from excessive lysosomal protease activity and its consequences.